Rufus and Rosie were born in a disused greenhouse of a garden centre; their mother had three kittens. When CP were called in, the mother was in the process of moving them; their brother was caught when they were about eight weeks old but the mum and the other two kittens (soon to be Rosie and Rufus) remained wild for about a month. When they were finally trapped, the kittens were about three months old. We got them in early February 2013. 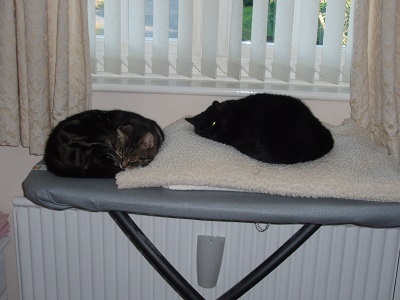 They were feral when we adopted them and they wouldn't go anywhere near humans. They lived in a cage for about three weeks in a quiet side room and when they thought you weren't looking they would come out and play. We invested in some serious play equipment and over the weeks we spent hours and hours playing with them to gain their trust, all the time in their safe room. Whilst they would trust us enough to play they still didn't like contact with humans so picking them up was a very slow process, lots of short bursts. 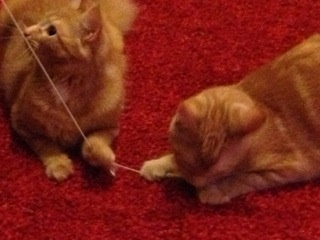 By late February, they eventually came out of their room on their own accord, enticed by yet another exciting toy. They were definitely feeling very at home by mid-March. Rosie discovered 'cat TV' also known as my fish tank. Rufus had bonded with Alfie, our really old cat; Rosie on the other hand had bonded with Harry the tortoise! By April they had definitely settled in; we still couldn't hold them for long periods of time but they were feeling more comfortable. From here they came on leaps and bounds, Rosie got furrier and furrier (I had always said that I wouldn't have a long haired cat!) and she definitely became 'my cat'. Rufus took a big shine to my eldest son and slept on (and often in) his bed every night. But they still loved each other as well. Often it got overwhelming, they were occasionally caught in places where they shouldn't be; it was obvious that they enjoyed a challenge! But they still love their toys and you would never know that once they disliked humans. They now live happily with a whole bunch of chickens and are an important part of our family. I volunteer with Cats Protection and I’ve seen that potential adopters often seem to want the same type of cat – the friendly, sit on your lap type; they don’t even consider the nervous cats. The problem is, although some of the cats that come into care are obviously gentle and loving, others are frightened or depressed, sometimes hissing because they are in a strange place with the smell of other cats. 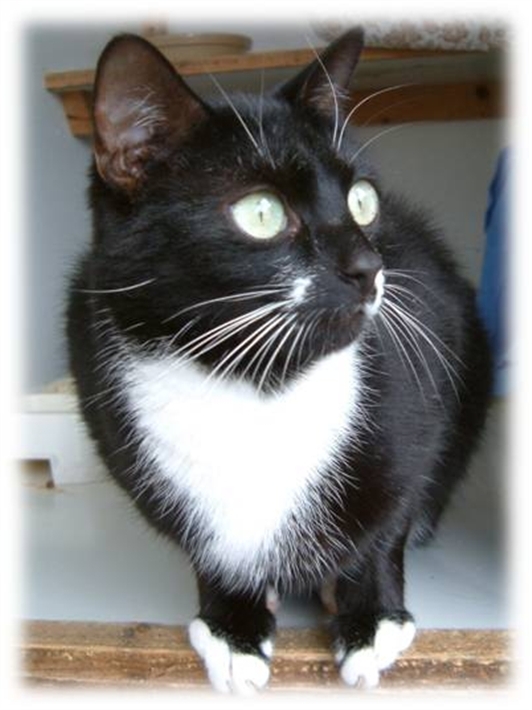 But we have had nervous cats go to their new homes and within a short time they have totally changed personality – back to a gentle loving cat. However, some cats need time and patience. I’ve experienced the joy of taking on a frightened, nervous cat and watching them change into a loving pet. When Billy’s half-brother sadly died, Billy was only four years old. 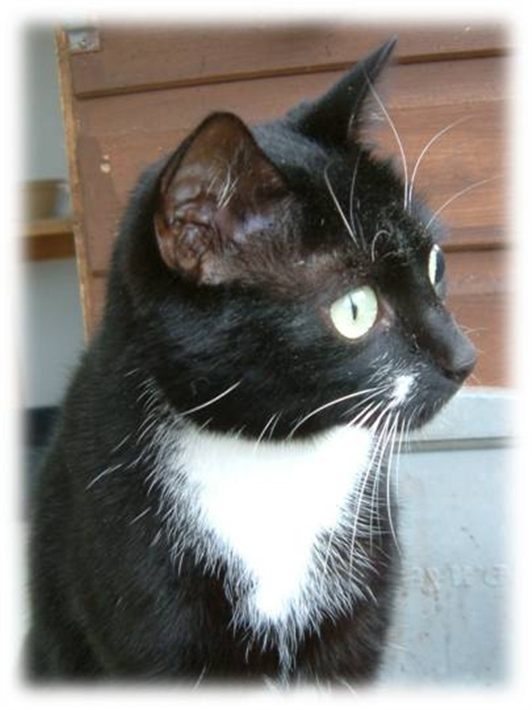 He’s a gentle, sweet little cat and we knew we needed to find a friend for him, so I looked at the cats in care. 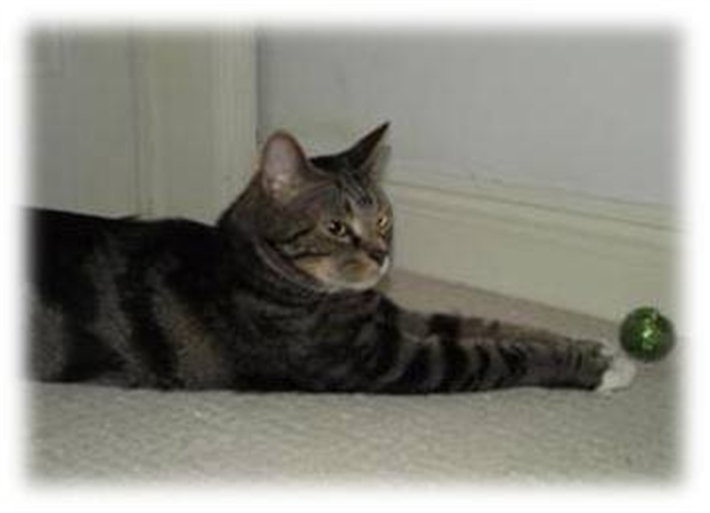 Jamie was a gentle, nervous little tabby boy aged three years old. His owner had found a new partner who did not like cats – so Jamie was given up. He was lovely with Rosemary and those of us who worked at the shelter, but as soon as someone came in looking to adopt a cat, Jamie rushed away to hide – so he was passed over. Rosemary feared he would be there for months unless someone was prepared to spend time to get to know him. One day when stroking Jamie, I asked Rosemary if he would be a good friend for Billy. Rosemary knew Billy as he had also come from the shelter and she agreed that it could work. So my husband came around to meet Jamie and surprisingly, he was able to stroke him and we decided to bring Jamie home. We gave him time to settle, in a separate room with a bed, a litter tray, his favourite food and somewhere he could “hide”. He was extremely nervous at the beginning and continually went behind the sofa. Both my husband and I spent many hours with him, stroking him when he would let us and trying to make him feel safe. 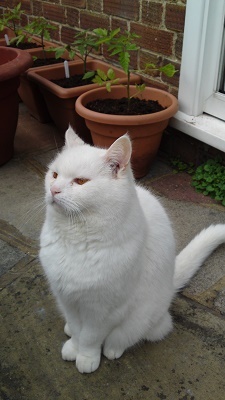 Our other cat, Billy, often stopped outside the door as he knew there was another cat on the other side. After about a week we opened the door and let Jamie explore more of the house. The cat flap was locked so he could not get out but he was able to see the garden from various windows. We took things slowly and let the two cats get to know one another; there were no arguments, both seemed to accept one another and eventually became devoted – as if they’d always been together. Both cats are the same height although Billy is a little heavier. They share food bowls, walk side by side up the garden and sometimes sleep next to one another. We love them both dearly, and had we not spent the time and effort to make Jamie feel he belonged, Billy would not have had such a wonderful friend. Cats come into care for all sorts of reasons – but the cat does not have a choice. Many seem to accept the situation and are easy to home but please don’t overlook those who find it harder to cope – they could be your perfect cat – given the chance. From feisty and angry to a devoted loving cat. By Paul and Gill. I saw Beany's face in the local paper and couldn't get him out of my mind. A week later I was compelled to ring Rosemary and ask about him. My opening line was "I am not sure I really want a cat but......."
Beany (then called Oliver) had been with Rosemary for more than six months. He was stunning. Large, white and chunky, with amber eyes and the most glorious fluffy coat. Why did no-one want him? Rosemary left me with him, and I tickled his cheeks with both hands and played with his ears. He quickly showed me that he wanted to play fight but I didn't see that as aggressive. Rosemary was worried that I would say ‘‘No’’ at that point as he was very feisty, and this put people off – they couldn’t see past his angry manner. But I felt a connection with Beany that surprised me. He seemed to like me - I already loved him. Rosemary was soon dropping him off at my home. Beany was an angry cat with some serious attitude problems. I learned that he didn't like men or anyone who smoked or drank alcohol…. Oh Dear... nor would he answer to his name of Oliver. However, very quickly Beany learned to trust me and my friend. The change in Beany from when he found us was incredible. From trying to take my friend’s arm off - to waiting by the door for him when he came in and using him as bed. Beany became very playful and very affectionate. He had bags of personality; he really was quite unique. I didn't know that cats could give so much love or were such great company. He was truly special. Within weeks of his arrival, he'd chosen his new name which he was more than happy to answer to. He knew he wasn't allowed into the front garden or anywhere near the road so he didn't venture that far. A couple of times I had to leave him when I went to France but I missed him so much. Beany came to France with me about 18 times. We stayed at my friend’s house where he had lots of room to play. He showed me wildlife I hadn't been fortunate enough to see before - slow worms, shrews, voles etc. He would come for walks around that garden every evening with me and sometimes with my friend. On route we would have games of chasing the windfall apples and zooming up the trees. Once he saw a young hare charge from one end of the garden to the other. He took off after it like a Greyhound. I’ve never seen a cat run so fast in my life - amazing. Beany never wanted to come back from France and would sit in the garden next door about 3 meters in. He knew I couldn't go in to get him as it was so overgrown but after re- arranging the ferries countless times, he eventually agreed to come back. He couldn't live without me or my friend any more than we could live without him. He loved his cuddles. During the night I'd wake to find him settled on me and that was very comforting. He was a devoted and loyal friend. He loved us. He fought Pancreatitis and survived. He fought liver cancer for almost a year but we lost him on 2.1.2014. It broke our hearts. There will never be another Beany. There is a reason that some cats are angry and hostile. With a little love and understanding they can put all that behind them and show caring people what they are really like. Beany was a truly special and wonderful cat. Here at Cats Protection we believe for every cat there is a perfect home. Sometimes cats can stay a little too long in our care but often it’s because they are waiting for the “right” owner to come through the door and that’s exactly what happened to Cheeky. 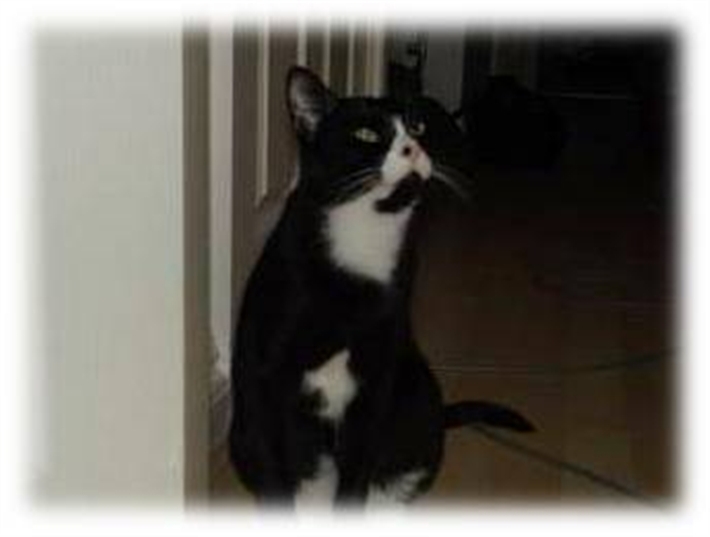 A young and lively black and white male cat that had no tail, Cheeky was very friendly – if he liked you! – but could be a little unruly if he didn’t. He was very playful but didn’t like other cats. Cheeky had been in our care for a long time, almost a year, and he hated it. He needed to find a good home, without other feline company and with a nice garden to run around in. 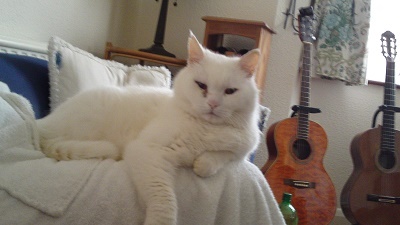 One day his now new ‘mum’ Kim was in the vets with her then cat who was receiving treatment for a brain tumour. Whilst in the waiting room, Kim noticed our ‘Cat of the Month’ poster featuring Cheeky and it really caught her eye. Sadly the cat she had taken to the vet passed away and she felt that without a cat, her house was somehow empty. So she decided to go and see Cheeky at the fosterers. Unfortunately Cheeky was not on his best behaviour that day; he was scratchy and snarly and less than appealing. Indeed that behaviour had seen off a few earlier prospective new owners. However as an experienced cat owner, Kim knew he wasn’t bad, he just needed love and a home and told our fosterer Rosemary that she’d take him. It must be said that all were quite nervous when Cheeky arrived at his new forever home, as no-one knew if grumpy or gorgeous Cheeky would come out! As fate would have it gorgeous and playful Cheeky emerged that day – and he has stayed that way ever since. He popped out of his basket so pleased to be out of the pen and played for ages with Kim’s daughter. That night he even jumped into bed and snuggled up to Kim, happy and grateful to be in his new forever home. Grumpy, scratchy Cheeky was not a bad cat he was just frustrated – as any of us would be if cooped up or months with no-one to play with or cuddle. He is now so at home and very settled. Kim describes him as good fun, wilful and playful and she loves him to bits. In fact so much so that she has said she would urge anyone wanting a cat to adopt a rescue cat as they really do make truly wonderful loving pets. I adopted Scruffy at the end of September. 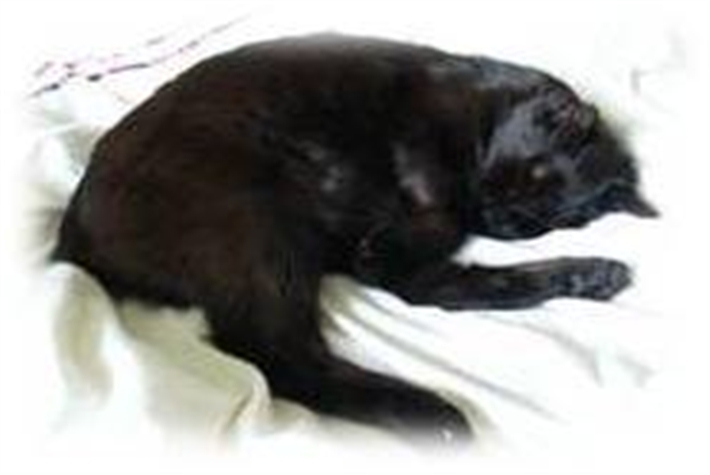 He is a ten year old lovely black tomcat who was very nervous - he seemed to have been roughed up by the neighbourhood cats at his last home. The first couple of days we had him, he hid out in the spare room, only coming out when we were asleep, but he soon started coming out for cuddles and strokes. Now, after a couple of months of getting used to us he is regularly snuggled up in his bed by the radiator and on our laps at every possible moment. He even comes to the door when he hears the keys in the lock! He is a gorgeous boy - very loving and affectionate and adores our company - if he can get into the bedroom he jumps into bed with us for cuddles! He has really blossomed in the last few weeks and loves being fussed over. 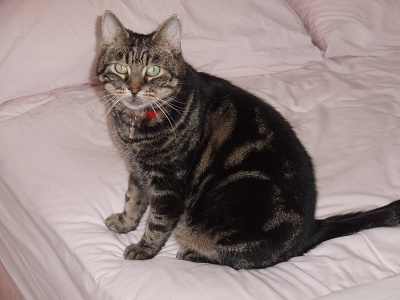 This is a photo of Scruffy in one of his favourite spots – our bed! So, another happy ending. During 2010 my partner and I began the search for a cat, we wanted to rescue one as there are so many out there that need a home. However we knew that finding the perfect cat would be challenging as we live in a flat, albeit a large one. So we set out with a slightly older cat in mind, maybe one that had enjoyed being an indoor cat previously. 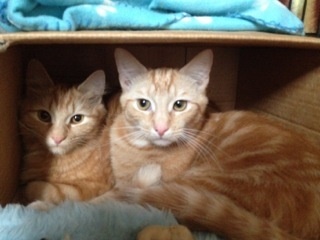 We got in touch with Cats Protection and were invited to see two brothers who it was felt may be suitable. We knew that we wanted Harry and Archie to come home with us as soon as we saw them; however, these were not the older cats that we were expecting. They were two 18 month old cats, who were just so nervous that they would not be suited for outdoor life just yet. Both my partner and I have experience with cats and felt that we were able to give these two lovely cats a home. Cats Protection was fantastic in assisting with moving the two cats. We were provided with a large pen for them to live in at first to ensure that we were able to go to them and handle them. We had prepared ourselves for a long road of helping the cats become comfortable with human company, but within six weeks both Harry and Archie were happily playing and wandering around the flat, demanding fuss and food! It has taken no time at all for them to develop from nervous animals, to the most loving pets you could have. We would not be without them! Our advice to anyone thinking of re-homing a cat would be not to ignore the ones that are shy or maybe hide away as they may be the ones with the most love to give!